If the looks appeal and you get the frets polished, this could be a very special guitar. Excellent tone and quality electronics. Issues with fret polishing are tough to excuse at this price. When it comes to Blueridge’s BR-180CE, it’s clear that the visual aesthetic used here will split plenty of opinions - but let’s start at the beginning. A solid Sitka spruce top sits atop a solid Indian rosewood back and sides - a wonderful tonal combination for a dreadnought that many of the bigger names in guitar building have used to great effect over the years. 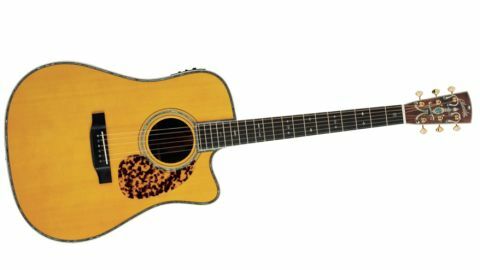 The top is stained for a yellowy, vintage look, and is adorned with abalone binding and a tortoiseshell-style pickguard. The bridge is a jet-black ebony, as too is the fingerboard, which rests on a mahogany neck that has been fashioned with an elegant diamond volute at the point where it joins the body. on the reverse. A nice touch on the back of the guitar is the lovely marquetry backstrip running between the two gorgeous slabs of rosewood - it’s a really lovely look and, truth be told, we’d personally have preferred that style on the rest of the guitar too. Elsewhere, the BR-180CE comes equipped with a Fishman Presys Blend pickup system, a great unit that you’ll see adorning a number of high-end electros. As you may guess from the name, the Presys Blend offers both microphone and undersaddle pickups, with a control to blend the signal from the two to create the ideal live sound. As well as the blend control you also get master volume, bass, middle, treble and notch controls and a phase switch to boot. There’s also a built-in tuner, naturally. In hand, the cutaway of the BR-180 naturally makes for superb fret access at the dusty end of the fingerboard, which adds nicely to its versatility in a live performance capacity. There is one flaw however, and that’s scratchy frets. Now don’t get us wrong - we don’t expect all budget guitars to have perfectly polished frets, as much as we’d love that. But to have this issue in a considerably more expensive guitar is definitely a disappointment. a possibility, but we can’t help but feel it should be better than it is out of the box, especially at this price. If you love the guitar in every other way though, then we’re sure it’s something you could get around. All in all this guitar is well crafted, and features a very distinctive design that will no doubt turn heads both ways, depending on taste! From our point of view the fret polishing is a disappointment, but there are many other traits to admire, not least the tones. All in all this guitar is well crafted, and features a very distinctive design that will no doubt turn heads both ways, depending on taste! time just makes it even more exciting. Both fingerpicking and flatpicking sound equally divine, though we confess that we do have a bit of a leaning towards fingerpicking when it comes to rosewood-bodied instruments. There’s just something special about that connection and the extra tonal depth that works exceptionally well, we think, but in this case flatpicking is no less wonderful an experience. Plugged in, the BR-180 offers a really flexible and high-quality live tone that can be easily tailored to suit the environment it’s playing in. The feedback controls work like a charm, while the microphone blend adds much-needed authenticity to the piezo tone. The tone controls are perfect for shaping the highs and lows as much as you see fit, with the mid control adding a bit of extra push at just the right frequency depending on how you’re set up and who else you’re playing with. The fact is that the BR-180CE in particular will be very much a ‘love it or loathe it’ situation, but it is well worth checking out.